Pop culture historian Robert Rodriguez has a new Beatles book just out. It’s the sequel to a previous title, “Fab Four FAQ: Everything Left to Know About the Beatles, and More!” This was released in 2007 and co-authored with Stuart Shea. It tells the story of the Beatles years in a new way – chronicling many previously unknown facts about the famous four and their recording career, friends, songs and lots of other stuff. It has its own dedicated web page. 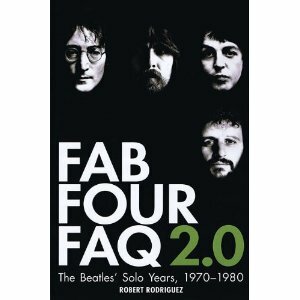 Rodriguez newest is called “Fab Four FAQ 2.0: The Beatles’ Solo Years 1970-1980”. As the title suggests this one looks at the group’s solo output over a ten-year period, and like the first book you can dip into it to discover facts and info that either you forgot or never knew about the recordings and lives of the Beatles as four individual artists. As with the first book, Rodriquez has created a stand-alone web page to accompany the book release. It is really worth a visit because it has some exclusive content not published in the book – including a free chapter you can download called “You Think You’re A Groove: Album Packaging”. In it Rodriguez takes a walk through some of the album art for many solo Beatles releases. Quite an interesting read for collectors of vinyl records and the often fascinating cover artwork they contained. (The website for the first book is worth a visit too – it has an additional four free chapters to download and read). Rodriguez is nothing if not prolific. Check out the latest book at Amazon. And there’s a review here. This entry was posted in Beatles, Beatles Collecting, Beatles Music, Beatles Related, George Harrison, John Lennon, Paul McCartney, Ringo Starr and tagged Beatles, Beatles Books, Beatles Collecting, Beatles Related, George Harrison, George Martin, John Lennon, Paul McCartney, Ringo Starr by beatlesblogger. Bookmark the permalink. Hi Arthur, thanks for the Facebook info on this book. The author Robert Rodriquez is obviously a prolific writer and source of Beatles info. Clearly he’s keen to share this as widely as possible given the two websites associated with his books that give additional content as well. You’re not kidding! If you look on the Fab Four FAQ 2.0 site, under ‘Links,’ there’s something called “The Beatles – Fifty Fabulous Years.” Not sure what it could be, but if his other works are any indication, it should be pretty amazing. who do I ask permission to cite some lyrics from the beatles, in a novel? It has some Beatles lyrics quoted and inside the front cover it says lyrics reproduced with permission from Song/ATV Music Publishing LLC. Select the country you are in, and then take it from there. Hope this helps. there’s another book coming out soon too, Robert Rodriguez was on wttw-11 last night in time for the Beatles fest this weekend in Chicago.